Number awareness and recognition begins even in infancy. Parents are a child’s first teacher; some parents may not be aware that their daily interactions with their children are teaching early math concepts! Suggested Ideas for Incorporating Early Math EVERYDAY! Labeling and counting objects around the house is a great place to begin: How many eggs are in a carton? – label an egg carton with Wikki Stix for a visual prompt. How many toys in that bin? – count toys at various times throughout the week and create the number of toys counted with Wikki Stix. Set the table and count the number of plates/cups/silverware on the table. Can the children create the number with Wikki Stix? Daily discussions and trips can include early math number recognition: How many days in the week? Create the numbers 1-7 with Wikki Stix and place them on the refrigerator at home or on a calendar in the classroom! Make a grocery list, count the number of items needed, and create that number with Wikki Stix. Wikki Stix is portable! Take a clipboard, paper, and Wikki Stix on a neighborhood walk. Discuss house numbers and see if your children can create the numbers with Wikki Stix. Count the number of books the children have on the bookshelf. 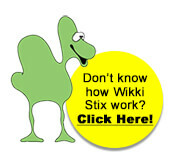 Invite the children to create the number of books with Wikki Stix. Incorporate clocks and time into daily routines! Check the current time and have the children create a simple clock with Wikki Stix. What numbers should the hands of the Wikki Stix created clock point to? 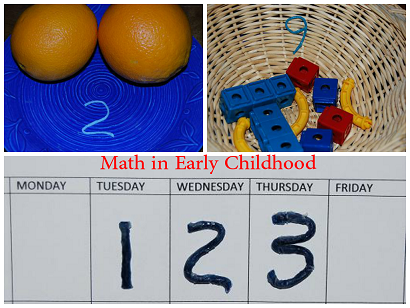 By inviting children to consider early math concepts within daily routines, even the youngest of children will begin to develop number awareness.